Imagine a wallpaper made with graphene that absorbs most of the light and heat in the rooms of your home, and generates enough electricity for all your needs so that you could eventually tear up your contract with your power provider. This could become a reality after scientists developed this incredible technology. Researchers from the University of Surrey’s Advanced Technology Institute in England said their graphene wallpaper could generate electricity even in rooms with very dim light. When a room is seemingly dark for the human eye, animals like moths are still able to see incredibly well. This ability of moths to ‘see in the dark’ inspired the scientists to adapt graphene to do the same. Could this be the Holy Grail for combating climate change – a technology that could dramatically reduce the amount of electricity we currently need to produce by burning fossil fuels? Is this the beginning of the end of the domestic electricity bill? The list of graphene’s remarkable qualities continues to grow – not only is it the thinnest and strongest material we know of, as well as being an incredibly good conductor of electricity and heat, it is now also the most light-absorbent material (weight-for-weight) on Earth. Professor Ravi Silva, Head of the Advanced Technology Institute, and colleagues wrote in the academic journal Science Advances (citation below) that this nanometer-thin material has great potential to power a wide range of applications from today’s growing list of the Internet of Things. The Internet of Things refers to a proposed development of the Internet in which virtually all everyday objects would be connected to the Internet, allowing them to send and receive data. Graphene is a remarkable new material made up of a single layer of pure carbon atoms which are arranged in a six-sided (hexagonal) lattice pattern. Scientists tell us it is over 207 times stronger that steel – and no material we know of is as thin or light. Prof. Silva said he and his colleagues took inspiration from nature to create ultra-thin graphene sheets designed specifically to capture significantly more light. They used a technique known as nanotexturing, which involves adding graphene around a textured metallic surface – the material becomes covered in nano-sized, one-dimensional structures. Nano refers to nanotechnology, which means working with things at molecular or atomic levels, i.e. super-super tiny. Although graphene is mighty strong, traditionally it has not been very efficient at absorbing light. To overcome this problem, the scientists used the nano-patterning to localize light into the tiny spaces between the textured surface, which made the material absorb about 90% more light. 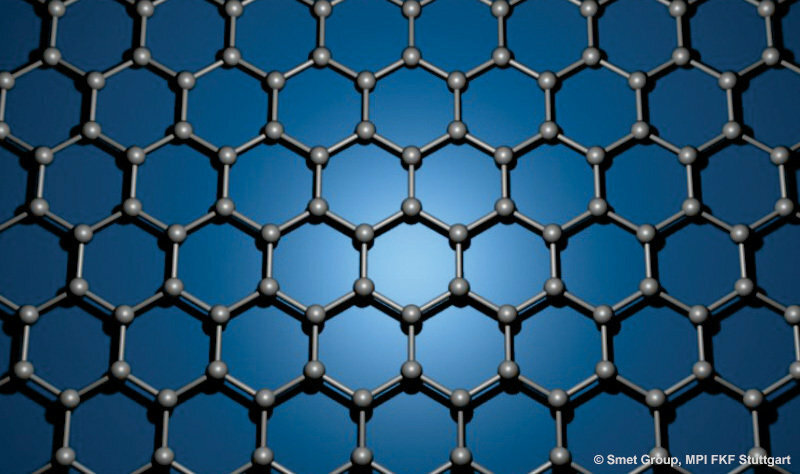 Graphene has been described by many researchers as possibly the next milestone in technology. It has been found to have impressive mechanical strength, fantastic electrical conductive capabilities, potential in a variety of electronic applications, used to make a spider’s web that could catch a full-sized falling aircraft, used to improve a microphone’s sensitivity by a factor of thirty-two, and used to make cheaper and longer-lasting light bulbs. It also improves energy storage, which could mean that the bulky batteries currently used in electric cars might become smaller and lighter. Professor Silva and colleagues said that for graphene to be a top candidate as a widely used product for future applications, it needs to also harness light and heat effectively. The team also believes that new kinds of energy harvesters and sensors connected through the Internet of Things could also benefit from this kind of (graphene) coating. Italian scientists found that if you spray a spider with graphene, you get a super-bionic web which is strong enough to catch a falling airplane. The next step will be to incorporate their new material into a variety of current and emerging technologies, the scientists said. The Surrey University scientists worked alongside experts from BAE Systems for infrared imaging in opto-MEMs devices. Citation: “Ultra-broadband light trapping using nanotextured decoupled graphene multilayers,” S. Ravi P. Silva, José V. Anguita, Jeremy Allam, Muhammad Ahmad & Sajad Haq. Science Advances. 26th February, 2016. DOI: 10.1126/sciadv.1501238.